Five star Tottenham give Millwall six of the best! Spurs had their most convincing FA Cup win since beating non-league Margate 6-0 in 1973, and the biggest FA Cup Win of the week-end (so far) with a 6-0 win against League One Millwall. The visitors, who brought a full contingent of over 3,000 fans, had been unbeaten in 17 games, and had conquered three Premier League teams on their way to this quarter-final. Despite losing top scorer Harry Kane to injury in the first 10 minutes, Spurs beat their London rivals in the most comprehensive fashion, with Son Heung-min likely to grab the headlines with a hat-trick. Son had started the game alongside Dele Alli, behind Harry Kane in a slightly weakened team, with Vorm, Trippier, Winks and Son getting starts instead of Lloris, Walker, Dembele, and Eriksen. There is no case for manager Mauricio Pochettino to answer regarding his team selection with a score line such as this one. Eriksen replaced Kane, who turned his ankle in an early challenge with Millwall's Jake Cooper. Harry walked off, and will hopefully not be absent for long, but this Spurs side showed they can score without him! The biggest cheer of the day was reserved for late substitute Vincent Janssen, who scored a terrific 79th minute goal to make it 5-0. It was Vincent's first goal from open play for Spurs, and the home fans gleefully chanted "He scores when he wants"! 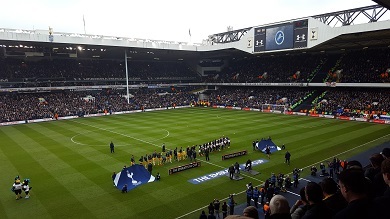 Pochettino stayed with his 3-4-2-1 formation, whilst the visitors played their usual 4-4-2 with veteran striker Steve Morison alongside top scorer Lee Gregory. One-time Spurs Academy player goalkeeper Jordan Archer was not fit to play, whilst another former Spurs youngster Calum Butcher did come off the bench in the second half. In truth, Michel Vorm saw little action in this game, as Spurs dominated from the start. Harry Winks, who impressed throughout, had an early shot saved, and Kieran Trippier's attempted follow-up was cleared. Winks then provided the pass for an attempt by Son,which goalkeeper Tom King held. King looked vulnerable on several occasions and would pay for this in added time to give Son his hat-trick. Harry Kane's cross/shot won a corner after Trippier's ball on the right. Winks took the corner after which Son missed his opportunity, but managed to get the ball to Winks, who shot again, but saw his effort cleared. Wanyama fed the ball to Son on the right. He had an effort from a sharp angle, but that was also saved. Kane went off and was replaced by Eriksen with Son and Dele Alli playing ahead of the Spurs playmaker. These three players were soon involved in a move with Eriksen feeding Son, whose long cross was headed towards goal by Alli, but intercepted. Millwall won a corner after a free kick conceded by Wanyama, but Vorm held the cross. One noticeable tactic of Millwall's harked back to the old days, with Morison behind the defence waiting for long goal kicks, from which he could not be offside. Spurs did not seem too alert to that situation, but really had no troubles. Wanyama carried the ball into the opposition half, feeding Eriksen who in turn passed to Dele Alli. Dele went down in the box, but there was no penalty and no card either. Millwall did get a shot on goal after a tussle between Dier and Gregory, with the ball falling in favour of Morison, whose shot passed wide of Vorm's left post. Vertonghen had a shot go over from the edge of the box after Eriksen's corner, but it wasn't long, and it was not a surprise when Spurs went ahead. Trippier passed inside to Eriksen, who exchanged with Alli, whose return was a header. Eriksen cleverly placed his shot through a sea of legs, and beat King to his right. Spurs were consistently playing good football. Again Wanyama brought the ball out of defence and Eriksen carried on the move with a pass to Davies, who crossed for Son, winning a corner on the left. Son wasn't always in control, when on the ball, but he was finding spaces left and right of the defence, and ultimately got a great reward for his efforts. From the corner, taken by Eriksen, Wanyama headed onto the bar. Spurs went 2-0 up in the 41st minute after a break through the middle by Dier and Alli. Son looked as if he had lost the ball towards the right of the box, but then recovered, turned and beat King with a brilliant left foot shot to the right of the keeper. 2-0 was no more than Spurs deserved. Wanyama needed treatment before the break, but recovered fully. Soon after the break, Dele Alli was receiving a long ball into the box, but just could not quite forge a shot on goal, despite two attempts to turn and shoot. Ben Davies had a solo run from the left to centre and hit a right footed shot which passed over the target. Dele Alli, Winks and Eriksen played successful tight passes around half-way before Eriksen took on the chance and hit a shot which was saved. Eriksen had another shot, which passed over the target, after a throw on the left and good interplay by Davies, Alli and Winks. Millwall did have another shot - by Williams - but he skied his effort in front of his own fans. Son made it 3-0 with a great goal in the 54th minute, collecting Trippier's long ball from the right; turning and scoring with a great half-volley with his right foot. By now, the very vocal home crowd (even the North Stand was noisy today) were taunting Millwall to the sound of "Hey Jude". Morison was replaced by Onyedinma who had an immediate impact on the right with a shot/cross, after which Wallace had a chance at the near post which he put wide. Winks, Alli and Eriksen were parties to a forward diagonal passing move which gave the ball to Ben Davies on the left. Davies passed inside and Son fired over from a sharp angle. Spurs went 4-0 up with a clinical goal. Harry Winks pushed the ball out to Trippier, who passed inside to Eriksen. Eriksen sent a short cross towards the back post where Dele Alli finished with a shot to the roof of the net. Soon after, he was replaced by Janssen. Wanyama had a shot from some 25 yards parried, before he was replaced by Sissoko, who took on the central position. Janssen's goal came after Eriksen passed to Son on the left. "Sonny" passed inside to Janssen who smacked a great left footed shot on the turn low to the right of goalkeeper King. Great cheers rang around the ground, and so did that "He scores when he wants" chant. Everybody in the ground on and off the pitch knew the significance of the goal. Janssen could have had another goal with a header from Vertonghen's pass, but he headed it too close to the keeper, whereas there was space to his right. In added time, Harry Winks hit a left foot shot just wide, and then Son got his hat-trick, following a determined run through the middle by Sissoko, and a pass by Eriksen before Son's shot crept over the line as King failed to hold. It was Son's first hat-trick for the club and his sixth FA Cup goal of the season, making him the equal highest FA Cup scorer this term. This was also Spurs' fourth hat-trick of 2017, and they have come in the last 13 games. This was also our last cup tie in the present incarnation of White Hart Lane, and certainly a most emphatic and memorable win. We now wait for tomorrow night's semi-final draw for our Wembley opponents on the 22nd or 23rd April, but of course we fear nobody! By my reckoning this was the first time we have scored 6 or more goals in a game since the November 2009 9-1 win over Wigan. I should mention that there was no trouble that I noticed in the stands during the game. There was a massive police operation today, with Metropolitan, City of London and British Transport Police involved. I personally have never seen anything quite like it for a home game. Millwall's fans were allowed out at the end of the game, but escorted down the High Road by hordes of Police. My perception was that the operation was successful, and I certainly hope there was no trouble of note.